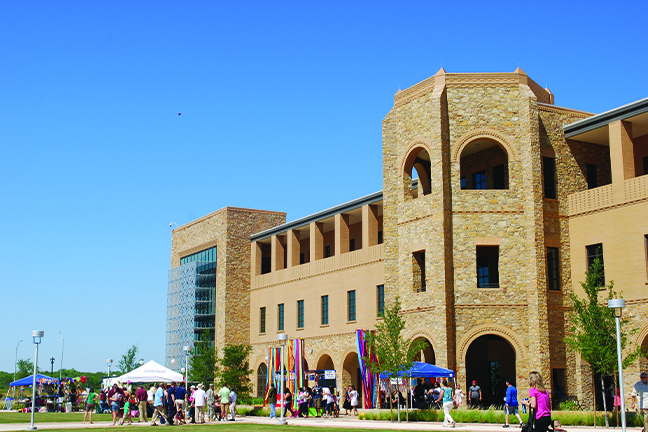 PINPOINT PRECISION—In an emergency, responders at Texas A&M-San Antonio would instantly have not only a building name, but also a floor level and the nearest office or classroom. A fire is reported in a biology lab. Campus security officers greet firefighters with digital maps showing entry points and information on flammable materials and nearest fire hydrants. Hiding in a classroom building where she thinks she has heard gunshots, a student alerts security to the situation via an app. Aware of her exact location, officers secure the scene and instruct her when it’s safe. Geographic information systems (GIS) and indoor positioning systems (IPS)—which provide an accurate way to locate students, safety officers, employees and others during an emergency—offer many security applications for campuses. These systems alert security when someone is not where they should be as well, says Pete Canavan, a safety consultant to colleges and the author of The Ultimate Guide to College Safety (PJC Services, 2018). The technology can also be used to locate assets such as lab equipment, tools and vehicles. Looking to explore or expand on GIS and IPS? You’ll need answers to a few key questions. 1. How do GIS and IPS differ? GIS technology provides a framework in which information can be organized, prioritized and optimally distributed via maps and 3D imagery. It’s all about map-based data. Through analysis of spatial relationships, users can obtain insights into location-based patterns and situations—such as how many people tend to be walking across the quad at 2 p.m. on a Friday. Along with the layering of visual details, GIS data can be linked to spreadsheets or other analytical tools. IPS tech focuses on building interiors and uses Wi-Fi or Bluetooth signals to locate people or objects. Signals are often broadcast by beacons installed in rooms or corridors. As a cell phone picks up the signal, internal calculations establish the precise location. This is fed to the positioning system. 2. What do these technologies look like in action? GIS and IPS technologies provide security personnel with timely and specific information. 1. Conduct a cost-benefit analysis to evaluate desired coverage, equipment costs and staffing requirements. 2. Establish a 24-hour security control center to monitor and respond to GIS, IPS and other security-related data. 3. Review IPS or GIS tech compatibility and integration capabilities with existing security systems. 4. Develop policies and procedures for students, staff, visitors and security personnel. 5. Provide training for security monitoring and response staff. Safety personnel can view only relevant assets and events based on their role and location, adds Sharp. This information may include automated external defibrillator kits for a medical emergency, or fellow security officers during an active shooter incident, for example. “Contextualized information can be consumed quickly via GIS to give decision-makers a head start in choosing the best response to the incident at hand,” he says. In other words, GIS technology fosters advance preparation that shortens response time when prompt action is needed, says MacNamara. For predetermined incidents, officers could instantly pull up a map revealing evacuation routes, where to position officers, how to divert traffic and where to station resources, he says. Crisis managers could implement those plans and then focus on matters more unique to the incident. IPS technology has recently been deployed across the entire Texas A&M University-San Antonio campus. Unlike earlier systems, SafeZone from CriticalArc provides campus police with a 3D view of multistory buildings. The system provides real-time locations of all available officers. Roger Lee Stearns, assistant chief of the university’s police department, says having that level of detail can significantly speed up response time. 3. Can we really rely on this technology? Despite their advantages, these systems are not foolproof. A request for help can be overlooked by an inattentive officer. A student who is ill or injured may not be able to activate an app. A network failure may take a system offline. With IPS apps designed for student safety, effectiveness is dependent on voluntary participation. “There’s no way to mandate a community download of an app,” Stearns says, adding that campus safety apps are a supplement to overall campus safety efforts and must be continuously promoted. Another consideration is staff time. Tasks ranging from operating control centers to analyzing GIS data can add significantly to personnel requirements. 4. What’s a good first step for getting started? Canavan, the safety consultant, recommends researching what kind of solution makes the most sense for your institution. Product details from vendors and tips from professional associations can also be informative. And don’t forget checking with local community officials, says MacNamara, of Sacred Heart. “Many municipalities already have GIS capability and are using it to make their communities safer.” Not only would most municipalities welcome a collaboration, but they’re also likely to be involved in responding to campus emergencies. Mark Rowh is a Virginia-based writer and frequent contributor to UB.